Joyce and Jim Lavene. A Finder’s Fee. New York: Berkley Prime Crime, 2013. Because the Outer Banks are sparsely populated we tend to forget that they have been inhabited for a long time. Native Americans, the ill-fated members of the Lost Colony,fishermen, later settlers, pirates–they all lived, loved, worked, and died on these barrier islands. In A Finder’s Fee, one of those early settlers, Maggie Madison, contacts Dae O’Donnell through an amber necklace that’s been given to Dae. In her own time (the 1600s), Maggie was thought to be a witch, but Maggie was just gifted, like Dae. Maggie reaches through time to Dae, asking Dae to gather up her bones and bury them beside her great love, Thomas Graham. Dae has other things on her mind–like running for re-election and managing her shop. But the kinship she feels for Maggie sends her to the site of Maggie’s home to collect her bones–where she finds a buried race car and a much more recent body. The car was once owned by Randal (“Mad Dog”) Wilson, Dae’s opponent in the Duck mayoral race. The body is that of Lightning Joe Walsh, the man who took such pleasure in beating Mad Dog. But Joe Walsh took pleasure anywhere he could, and as Dae looks into his murder she finds that many of her friends had ties–some sweet, some painful–to the dead man. Dae turns to Kevin, the ex-FBI man who has won her heart and her grandfather, a lawman at the time Walsh disappeared, for help, but it is Maggie Madison who is there for Dae in her time of greatest peril. This is the fifth novel in the Missing Pieces Mysteries series. Joyce and Jim Lavene. A Haunting Dream. New York: Berkley Prime Crime, 2012. Dae O’Donnell has been enjoying her life. She’s in her first term as the mayor of Duck, North Carolina and her popularity is high, in part because of her role in keeping the local bookshop and coffee house open. Dae’s also in a relationship with a very nice man, Kevin Brickman, who’s been running the Blue Whale Inn for the past year. Kevin is from away, but he fits in with the locals the way few outsiders do. His background as an FBI agent never comes up, and although Dae knows that Kevin was once engaged to an FBI colleague, she doesn’t dwell on it. But suddenly, she has to. Kevin’s former fiancée, Ann, shows up, seemingly wanting to pick up where they left off. But Kevin is not the same person, and neither is Ann. As work partners, Kevin and Ann pulled a number of missing child cases. When they they failed to find a child alive, it was hard on them, so hard that Ann eventually broke down. The woman who shows up in Duck is a wraith, still showing evidence of her trauma and institutionalization. Given Ann’s state, Dae decides that she needs to keep some distance from Kevin while he and Ann sort things out. And Dae has some business to attend to. Her elderly neighbor, Mac Sweeney, enlists Dae’s help in finding a missing medallion, one that Old Man Sweeney had picked up in a grocery store parking lot. When Dae calls upon her psychic gift to find the medallion, she sees a vision of its true owner, local realtor Chuck Sparks, being shot. Soon she finds his body, but not his young daughter. As she attempts to find the girl, Dae learns about a criminal ring trading in stolen artifacts, people who will do anything to get their hands on certain treasures. The FBI are called in, but when Dae senses that time is running out for the girl, she and Ann join forces. This is the fourth Missing Pieces Mystery. To start the series at the beginning, read A Spirited Gift. Joyce and Jim Lavene. A Spirited Gift. New York: Berkley Prime Crime, 2011. October 15th is always a hard day for Dae O’Donnell because it is the anniversary of her mother’s death. Although she makes time for her annual séance in an attempt to make contact with her mother, Dae has pressing matters to attend to. This is also the first day of the Mayors’ Conference Weekend, Dae’s brainchild that brings twenty mayors to Duck, North Carolina, to discuss issues that affect their coastal communities. Things are off to a great start at the Blue Whale Inn (which, incidentally, Dae’s boyfriend Kevin Brickman runs) with the politicians happily mingling. But Mother Nature has a different plan. What started as a little bit of rain has suddenly turned into a full-force hurricane, wrecking havoc all along the Outer Banks. Although everyone is supposed to be safe and sound at the Blue Whale, one mayor is missing: Sandi Foxx, Manteo’s flirtatious leader. When Dae finds Sandi’s diamond and ruby ring and thanks to her psychic abilities “feels” Sandi’s fear right before she lost it, she begins to worry for Sandi’s safety. The next day, Dae discovers Sandi’s body in a shed, and in the midst of the clean-up from the hurricane, the town of Duck undergoes a murder investigation. As mayor, Dae tries to stay involved, and she has help from an unusual source: the ghost of Rafe Masterson, a distant relative and a pirate. With Rafe’s insight and prodding, Dae is able to find out who is disrupting her quiet community and to right some centuries-old wrongs. This is the third Missing Pieces Mystery. To start the series at the beginning, read A Spirited Gift. Joyce and Jim Lavene. A Touch of Gold. New York: Berkley Prime Crime, 2011. Life in Duck, North Carolina, during the off season can be slow for the residents of this Outer Banks hamlet. Although the town is fairly small, its history, lore, and spirit more than make up for its size. The quiet of the off season suddenly changes when the Duck Historical Museum explodes. All of the relics–some centuries-old–are destroyed, but that is not the only loss to the community. The greatest tragedy in this strange event is the death of Max Caudle, museum curator and Duck expert, who perished in the blast. Dae O’Donnell, mayor of Duck and close friend of Max is heartbroken – and oddly affected. Dae, who had been helping Max with a program for school children just before the explosion, was very close to the building before it went up in flames. Now, in addition to her ability to help people find lost objects just by touching them, Dae can “see” the history of things. Law enforcement officials in Duck think that they have a solid suspect in the arson and the murder of Max until that person is found dead. Later Max’s widow’s home is destroyed. 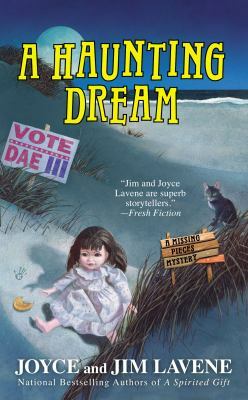 Using her powerful gift, Dae, with the help of ex-FBI agent and beau Kevin Brickman, tries to discover who is wrecking havoc on the coastal village. Their investigation takes them into many aspects of Duck’s past, including long-buried family secrets and gold. A Touch of Gold is the second novel in the “Missing Pieces Mystery” series. Joyce and Jim Lavene. A Timely Vision. New York: Berkley Prime Crime, 2010. Sibling rivalry can be the cause for bitter grudges, and in the case of the Butler sisters, decades of differences have created a long rift. Although they love each other, Miss Mildred acts strangely when her fellow nonagenarian sister Lizzie is found dead. Dae O’Donnell, mayor of Duck, North Carolina, and owner of Missing Pieces, a shop that specializes in the unique, is involved in the mystery of Miss Elizabeth’s death because she made the unfortunate discovery. 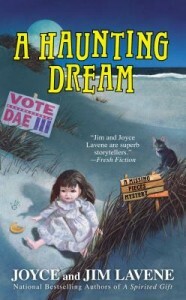 Dae is blessed (or cursed) with psychic abilities; she was on a mission to help Miss Millie find her mother’s watch when she found her dead sister. Now the police chief is convinced that Miss Millie had something to do with Miss Elizabeth’s death. Miss Millie’s odd reaction to the murder and her claims that she sees her sister’s ghost is not helping her situation. Dae fights to protect Millie, but she is taken into custody. When Dae learns that both sisters’ properties have been put up for auction, she begins to suspect the new realtor in town and others who could benefit from the Butler sisters “going away” and their homes going up for sale. A Timely Vision is the first novel in the “Missing Pieces Mystery” series. Joyce and Jim Lavene. A Corpse for Yew. New York: Berkley Prime Crime, 2009. Botanist and garden shop owner Peggy Lee is having a bad time of it. The worst drought in North Carolina history has killed the business at Peggy’s shop, The Potting Shed, and Peggy’s parents have moved to Charlotte, forcing Peggy to hide boyfriend Steve’s live-in status. Because business is so slow, Peggy agrees to go with her mother on an artifact dig. Instead of finding old pottery shards and bones, they uncover a fresh corpse. The “dead geriatric socialite” (the indelicate words of the first policeman on the scene) is one of the most esteemed members of the Shamrock Historical Society–and the aunt of the police chief. The ladies want to know what’s happened, and so does the Charlotte power structure. When it appears that the victim died from ingesting yew berries, Peggy knows she has to get involved. The book includes tips for successful gardening when water is in short supply. This is the fifth novel in the Peggy Lee Garden Mysteries series. Joyce and Jim Lavene. The Telltale Turtle. Woodbury, MN: Midnight Ink, 2008. Mary Catherine Roberts is a pet psychic with her own syndicated radio show. Even without such a distinctive vocation, Mary Catherine would never be just a face in the crowd. She’s a showy dresser, someone who speaks up for herself, and she runs a clinic for injured and abandoned animals right in the heart of downtown Wilmington. One day on her way home from the radio station, Mary Catherine hears the voice of an injured, frightened animal. She follows the voice to a house in Wilmington’s historic district. The front door opens at her touch, and in the parlor Mary Catherine finds the body of a middle-aged woman and a bleeding turtle. The dead woman was the aunt of the radio station manager, Colin Jamison. The police suspect him of the murder, but Mary Catherine knows he’s not capable of it and Tommy, the turtle, assures her that Colin is not the killer. Mary Catherine tries to work with the police (who give no credence to her insights) even as her life is complicated by the attentions of two men who show interest in becoming Mary Catherine’s husband #5. Joyce and Jim Lavene. The First Shall Be Last. New York: Avalon Books, 2007. What an ending to the Sharyn Howard mystery series! Sheriff Howard confounds her colleagues and family by breaking off her long-time romantic relationship with county coroner Nick Thomopolis and taking up with sleazy state senator Jack Winter. Sharyn had previously been suspicious of Winter, seeing him as a corrupt political operative and suspecting him of involvement in her father’s death. Now she’s his arm candy! People give Sharyn an earful on this, but her moves are part of a plan hatched by the FBI to bring Winter to justice. As the plan moves forward, Sharyn and her deputies contend with snow-related emergencies, office romances, and break-ins and murders that may or may not be related to Senator Winter. Joyce and Jim Lavene. Before the Last Lap. New York: Avalon Books, 2005. In some workplaces, colleagues come to feel like family. That’s how Sheriff Sharyn Howard feels about some of the men and women in her department. When her assistant, Trudy Robinson, is linked to two murders and Trudy’s husband, a deputy sheriff, confesses to the killings to protect his wife, Sheriff Howard goes into overdrive. She’s sure that the killings have to do with skulduggery at the speedway, but she’s hampered by the community’s anger over the death of a popular driver and the FBI’s unexplained interest in the case. 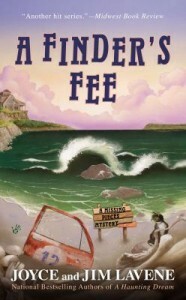 This is the eleventh Sharyn Howard mystery. Joyce and Jim Lavene. Last One Down. New York: Avalon Books, 2004. When Sheriff Sharyn Howard leaves Diamond Springs to attend a law enforcement training retreat, her staff must solve a murder and deal with a sniper in town. Meanwhile, Sharyn has her own problems. One of her deputies is seriously injured when he falls down an old mine shaft, another man is found dead in the woods, and several others are killed when a car explodes. Unfortunately, the retreat is in an abandoned mining town on isolated Sweet Potato Mountain, their radio is broken, and a vicious storm begins flooding the area streams. This is the tenth book in the series of Sharyn Howard mysteries.